An Anti-Mall is an alternative space, where people support one another through art, activism, community building, sustainable agriculture, sharing, giving, and receiving. 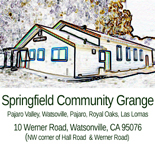 Currently, the Springfield Grange is accepting vendor applications. If you are a creative spirit, we may have a spot for you to sell your goods and wares. Contact Dvera for more details (disaxton@gmail.com or by phone, 610-742-5066). Do your holiday shopping a different way this year by investing in your community, while at the same time, walking away with an AMAZING selection of handcrafted items: crafts, photography, ceramics, jewelry, body care, preserves, baked goods, woodcarving, musical instruments, plants, flowers, wreaths, and more. Organic and GMO-free refreshments available for purchase on site. Flyers in English and Spanish are reposted below. I’ll be selling my one of a kind crafts at this one of a kind ANTI -Mall sale, come out and join us. This entry was posted on November 7, 2012 by dveraisaxton in News.